"The Lagoon Nebula in Three Colors"
Description: A fascination with the sciences reveals itself in Garrison Buxton's art--in the creative process as well as in the titles. 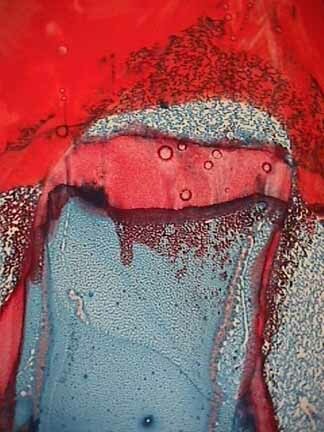 Buxton's inventive painting process, "flash printing", requires a sound knowledge of the chemistry of inks and paints. Buxton's fugitive images are as much spontaneous as contrived; the surface color varies enormously in its character: sometimes richly viscous and sometimes splintering into fractal-like shapes. View detail of "The Lagoon Nebula in Three Colors". 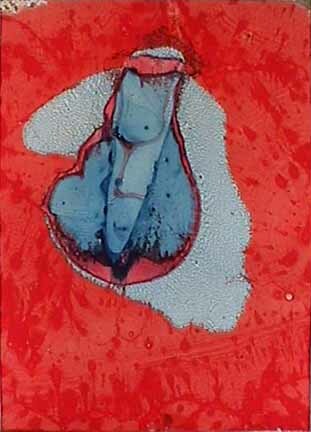 This work and its title poetically refer to the red glow of the nebula. Oklahoma-born, Garrison Buxton is a recent graduate of Pratt Institute where he currently teaches printmaking. Buxton's studio is in New York City. View more Garrison Buxton paintings.